The Flagship amp in the Carr line. True tone for any guitar player! From Jazz to Rock and anywhere in between. This amp sets the bar! Because of our special relationship with Carr we can get this as fast, or faster than anyone in the industry. In some cases, we even have preferred build slots we can offer you. Brilliant! What more can we say? From the early days of Carr when we first started carrying these at Indoor Storm, we couldn't get enought of the Rambler! It was used on about 90% of our available sound files because of how well in represented the guitar itself. The amp has such a sweet, full, and rich tone that it became the one amp we turned to. It takes pedals wonderfully. From Bedroom, to Studio, to Stage, the Rambler performs brilliantly in any scenario! 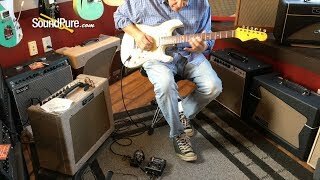 In this video, Sound Pure electric guitar specialist Eddie Berman plays a Nash S-63 through a Carr Rambler with a Xact tone precession pedal and a Strymon El Capistan pedal.